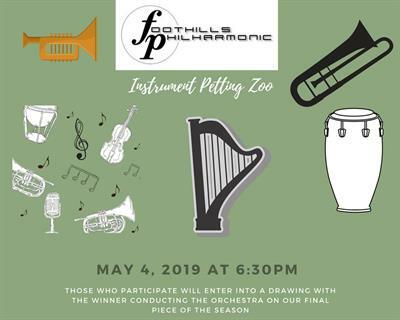 The Foothills Philharmonic Orchestra concludes its 2018-19 season at the Riverside Baptist 1249 S. Suber Rd Greer, SC 29650, Saturday, May 4, 2019, at 3:30pm and 7:30 p.m. with the Sensory Friendly Concert for special needs children (3:30pm) and the Annual Pops Concert and Instrument Petting Zoo (7:30pm). Events for the Sensory Friendly Concert will begin at 1pm, culminating in the concert at 3:30pm. All of Foothills’ concerts are free and general admission to the public. Refreshments will be provided following the performance at our reception where people can meet and greet the performers. Both programs include popular music favorites from movies, classical music, and television shows. In addition, we will be holding an instrument petting zoo open for all children at both concerts. At this event, children of all ages will be able to try out the different instruments of the orchestra as we work to encourage the next generation to pursue music studies on an orchestral instrument. 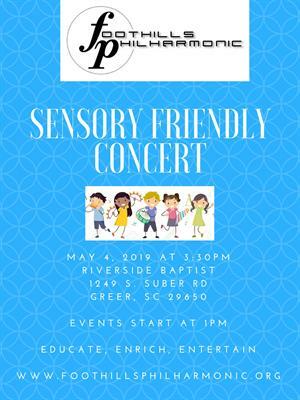 For the Sensory Friendly Concert, multiple organizations will be present to offer assistance for families of special needs children, along with special activities for the children to enjoy.